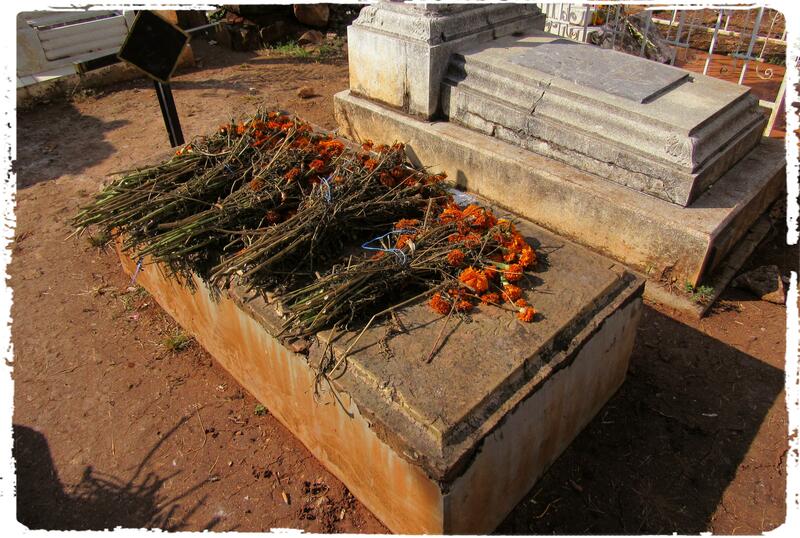 Somebody’s tomb with bouquets of old marigolds. MY WIFE WAS born at home and delivered by her father who was a physician. The town was Uruapan where they lived briefly before relocating to the nearby village of Taretan. It’s a town that’s on nobody’s tourist trail. It was Taretan where another child was born, a girl, then another, a boy, and that ended Mama. Dead at 31. Mama is buried at the cemetery in Taretan and so is Father who died many years later at age 61 — still too young. Normally, on the day following the Day of the Dead, we drive to Taretan to tidy up the tombs. That would have been a week back, but we didn’t make it due to a renovation project ongoing at the Hacienda. More on that in a week or two. So we went yesterday. The cemetery was deserted, which is how I like a cemetery. There was Mama and, some distance away, there was Father. They are not buried side by side. The inscription on the grave adjoining Father’s is totally illegible to the casual observer. My wife decided to figure it out and, with much effort, did so. It’s one of Father’s brothers who was shot dead at the age of 18 in the 1930s. We doubt anyone in the family who is currently alive is aware of that, and it partly explains why Father is buried in the adjoining plot instead of next to Mama. It was another brother who decided to bury Father in that particular spot. Moving another plot to the left, there is a well-tended tomb on which the inscription is quite clear. My wife recognizes the name of an old friend of her father’s. The inscription says that he was murdered by “an enemy of the people.” One wonders about the details in that case. Following the cemetery visit, we drove to the plaza where there is an ice cream parlor. She got coconut and I picked strawberry. We sat on a sidewalk table and watched people pass by. Sort of a Mexican Mayberry but with darker tones. 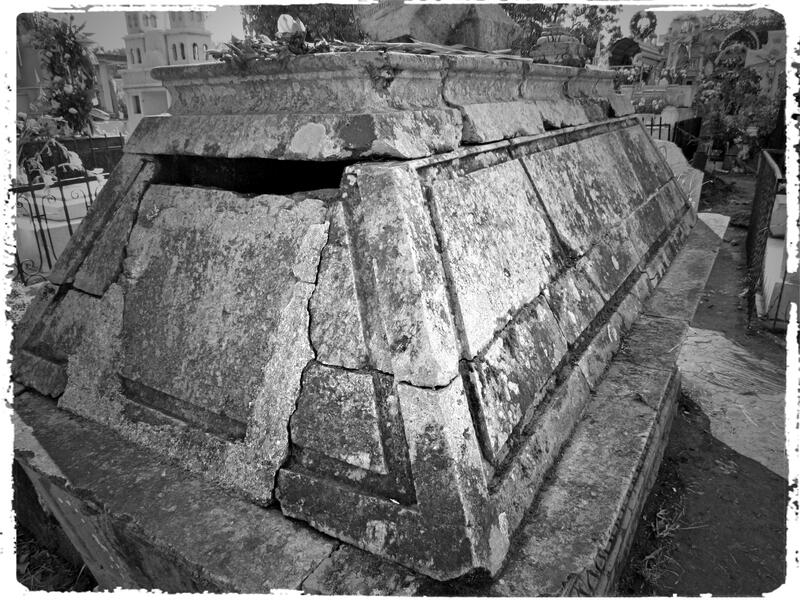 A bonus tomb that looks like a Civil War Ironclad. There is an article every year around this time about a tribe (?) of people in some remote place in tropical Asia that explains the tradition of unburying their dead, dressing them in new clothes and going walkabout for a little fresh air. Carole: Well, I’d certainly like to get a glimpse of that. Carole: Reminds me of the mummies in Guanajuato except we Mexicans do not play with them. I’m going to have to give a class on how to make short URLs. I already did it to the one you left. See how nice and compact it is? Oh, wow! I clicked on the last photo (I always click to enlarge them), and then clicked once more for a really enlarged view. The detail in the background on the right is fantastic. That would be a fabulous photo in and of itself! I love empty cemeteries too, for quiet contemplation and photography. I have a bunch of photos from a local cemetery that has tombstones from the initial settlers to that valley here in Northern California. Lots of history there, but I can’t bring myself to post those photos; feel like the souls may not like that and come back to tell me so. Que dios los bendiga! Angeline: On the other hand, maybe the souls stuck in the cemetery would appreciate being reintroduced to polite and breathing society. You just never know. I am always leery of cemeteries. When I was about five or six, my mother took us to a burial at an old graveyard out in the desert. On the way to the grave, the pallbearers came across a medium-sized rattler. Then we saw an even bigger one. Everyone stood around the grave with sticks in their hands. For the life of me, I cannot remember who was being buried, but those snakes still stick in my mind. Señor Gill: Odd, isn’t it, the things we remember? So why don’t you go before the day of the dead? Any thoughts on getting your wife’s uncle’s inscription made clearer? Where we often wonder whether there are more dead people in New England than the living. There are certainly loads of cemeteries everywhere. Kim: Day before, day after. It’s just been more convenient to go the day after. Plus, when we go the day after, some of the kin in Taretan have usually done the tidying for us, plus flowers. As for the inscription on the uncle’s stone, we have higher priority issues in the grave category, specifically, repairing Mama’s slowly disintegrating situation. It gets talked about every year, but then it gets forgotten till the following year. I just did a super-quick image search on Taretan (no Google Streetview), and it looks lovely. Maybe you could write a post about it. Saludos! Kim: No surprise there’s no Google view. We’re talking serious Mexican Podunk. As for writing a post about it, there’s really not much that can be said.